Those who’ve explored this site in the past will know that I have analysed the geography of train networks on multiple occasions, particularly in the United Kingdom. Maybe it’s my bias being a rail commuter, but it’s a topic I’m returning to again! Access to train networks shapes many people’s lives – and is two-fold. Am I near to a station and are the trains reliable? To investigate ‘access’, we start by exploring the relationship between population density and station density in the UK. Are there ‘gaps’ in train station provision? Next we examine then the temporal and spatial patterns of train punctuality. To analyse the pattern of train stations to ‘need’, i.e. population, a simple ‘hot spot’ kernel density analysis of population and train stations. An important caveat to this is that this is a crude analysis, comparing the densities visually. Ideally a series of regional analyses with travel time analysis would provide greater depth to this analysis. Nonetheless, some patterns emerge. There is, as expected a density of population and stations in London, and generally in major urban centres of West Midlands and the North West. However, the noticeably, on the ‘2nd tier’ of urban areas, there appears to be under provisioned in the North East Tyneside conurbation. Additionally, medium sized urban areas, like Leicester, Northampton, Peterborough, Swindon and Nottingham – appear to also be under resourced. There is also a rural story here. Note areas such as – Mid Wales, Ceridigion, North Cornwall/Devon coast, North Yorkshire – have few, if no, rail stations. One has to take into account physical geography here – constructing or maintaining train lines winding valleys and hills is not an easy or inexpensive task. Plus many stations act as a regional ‘hub’ for surrounding rural areas. However as we have explored previously, some areas are over 20 miles (as the crow flies) from these hubs. Nonetheless, rural areas such as Oxfordshire and Cheshire appear better provisioned. The situation of these areas in more affluent and ‘commuter belts’ are arguably factors, compared to these more peripheral rural area. Villages such as Radley and Islip (Oxon) have reopened services, whereas Bude, Caridgan have no station. Sure, private transport may fill the need in these areas, but private transport incurs it’s own costs and is not available for everyone. The ‘Beeching Axe’ didn’t fall evenly. I cannot fully answer this question, but I can approximate ‘where’, exploring average delays and cancellations over rail network franchises. Commuters, like me, often complain about high prices and delays in their areas – but could you have it worse in another part of the country? Is it getting worse? For those unfamiliar with UK transport ownership structure, Network Rail is government organisation that maintains and owns railway lines and assets (though use private engineering firms). The trains that travel regional or cross-regional routes are run by private franchises. This dichotomy can be a source of political debate. I have tried to represent these franchises and their punctuality data, by determining the primary route operator (e.g. London Paddington to Swansea – GWR). Two important caveats are that this punctuality data is an average over a franchise operating area, not by each route. Also while I have graphs on cross regional operators (e.g. Cross Country, TransPennine), these aren’t represented on the maps themselves. Nonetheless, some interesting trends emerge from the graphs and maps. There is a general increase in cancelled and significantly delayed trains over time – this despite increasing prices above inflation. 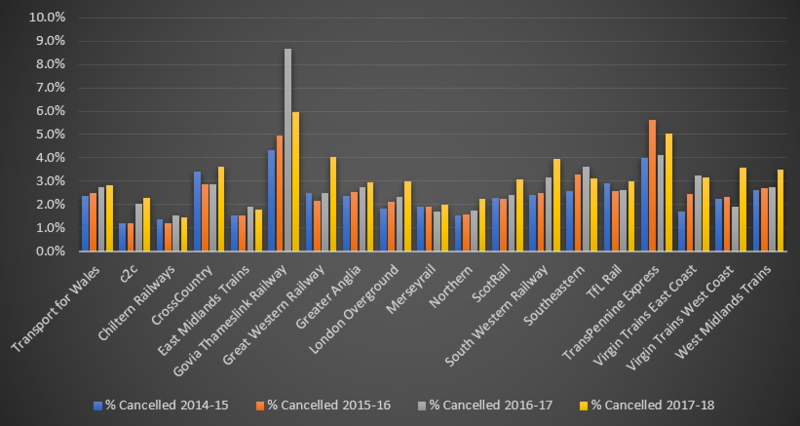 Geographically speaking, particularly evident is the high level of cancelled on the Govia Thameslink lines north and south of London (operator of Great Northern, Southern and Thameslink) – a rate in 2017-18 of 6% (see above graph). Being in southwest England also seems disadvantageous with Great Western Railway and South Western Railway, having a cancellation rate of 4% – think this as a 1 in 25 chance of having your train delayed. As an average overall, from 2014-15 to 2017-18 there was an increase in cancellations from 2.8% to 3.2% – an increase visible in the animated gif below. These issues aren’t geographically restricted to southern England – the north of England, with Northern, Virgin Trains and TransPennine experience relatively high cancellation rates (see above and here), as well as high rates of significant delays (see maps below). Scotland and Wales have seen train operators also increase in cancellation rates. There have been infrastructure projects (such as GWR electrification) and transfers of franchise – e.g. Transport for Wales is a recent successor to Arriva Trains Wales – which maybe should be taken into account. But this period has seen increasing costs and few abnormally pattern extreme weather events to account for this rise over time. 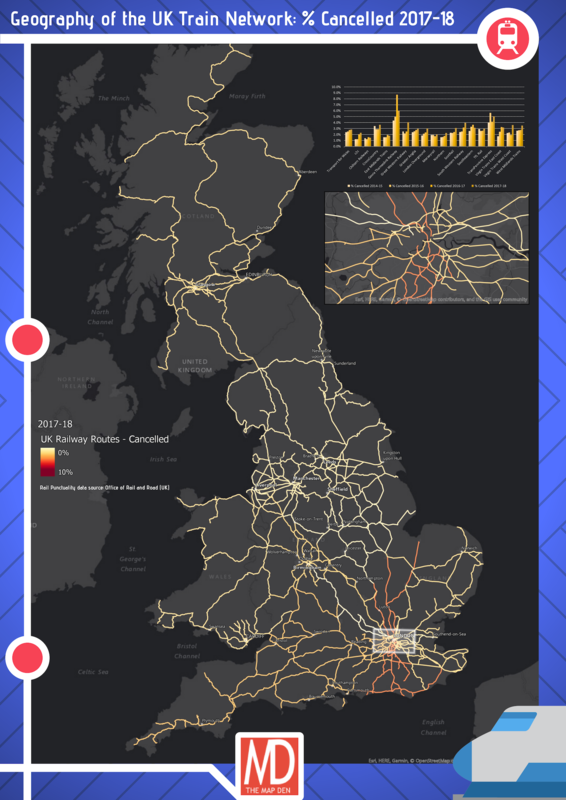 One can speculate – while the issue of punctuality is spread over all of mainland UK – the geographical patterns of cancellations and late running trains reveals differing levels of strain and condition geographically of UK’s creaking and old railway network. Unequal geography of infrastructure and transport shape our daily lives and a nation’s economy – whether it be travelling to work, meetings, visiting family and friends, or tourism. In this case of train networks, this inequality particularly affects those without access or funds for private transport. Furthermore, given the lower carbon footprint of train travel compared to driving, it makes a reliable geography of train transportation more important. ‘Access’ is a multi-level term in this context – firstly, how near is your station; secondly, how reliable is the train service when you get there? The differences in this access is variable, both in space and time, often following the pattern of ‘core-periphery’. This core-periphery pattern of access to train shapes both lives and economics. For example, can one commute and apply for work outside their place of residence, or will they have to move to the (expensive) core, or turn down an opportunity? Will a company move to an area with poorer transport reliability, providing opportunities for an area, or will they go elsewhere? It plays into the inequality of opportunity. Next Post: Christmas Metro Map 2018 – who delivers your presents?